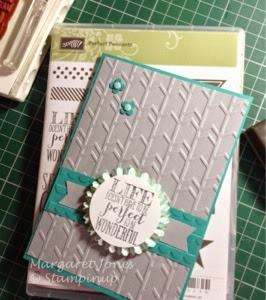 This one uses Cardstock of Bermuda Bay and Smoky Slate, two different embossing folders, a sentiment from the stampset Perfect Pennants layered on top of a rosette made from Designer series paper. It is then finished with a couple of punched Itty bitty flowers with candy dots on top. This one S you can see is different. 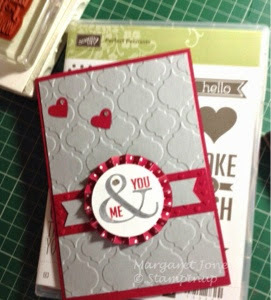 The Cardstock is Raspberry Ripple and Smoky Slate. Two different embossing folders from the one above have been used. The sentiment is from the same set with a gem placed on top and it is finished off with two small hearts with gems on top.